We’re all well aware of what a bad deal the bees have been getting in recent years. Simply put, the bees are dying globally at an alarming rate! Hell, the minute they get put on the endangered species list, bureaucracy steps in to say, “not so fast.” Now, on top of everything, hundreds of their hives are mysteriously being stolen in New Zealand. According to local law enforcement, 400 bee or honey thefts have been reported over the course of the six months leading into January. Police are unsure who is the culprit is but they believe the thieves’ motive to be the increasing price of native Mānuka honey. In a single year, New Zealand’s honey industry saw a 35 percent jump in exports, bringing in $315 million New Zealand dollars ($219 million) to the country. “It’s rife. Honey is overpriced mate, it’s ludicrous. There’s easy money being made if you buy and sell hives.” Bruce Robertson, managing director of Haines Apiaries in Kaitaia, tells Reuters. Mānuka honey is said to have a “mineral, slightly bitter” taste and his sought after for what people believe to be antibacterial properties. Studies have found insufficient information that it’s useful as a topical treatment for wounds. A 2012 study found that the honey does include an antibacterial component known as Methylglyoxal. But the fad of Mānuka honey as some sort of wonder-food has led to rampant mislabeling and fraud. Who could be responsible for starting a trend in which a honey that doesn’t taste very good is believed to have magical properties? You guessed it, Gwyneth Paltrow and her Goop hordes. Now, the honey goes for around $104 per kilogram and a hive is worth around $1,390.00. 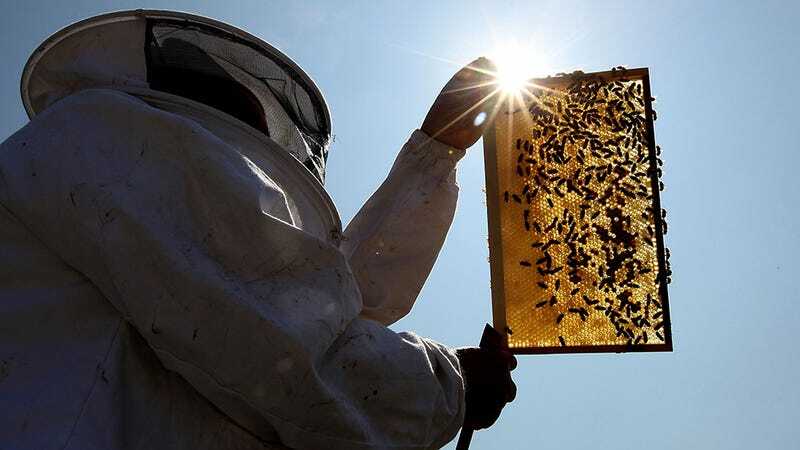 Laurence Burkin, apiarist manager at The True Honey Co, tell Reuters, “It doesn’t matter if it’s beekeeping or meth, this is just the new gold rush.” It’s funny that Burkin mentions meth because just last month another odd trend of thievery hit New Zealand. Hundreds of garden gnomes and pink flamingos were reportedly being stolen to pay for methamphetamine. Bee hives falling into the wrong hands is a worrisome development in the plight of the bees. But with 400 cases, we can at least take heart in knowing, surely, at least one of the heists went wrong and resulted in some slapstick panic.